Some 2,600 Internal Revenue Service managers gathered in Anaheim, Calif., in August 2010 were treated to $50,000 worth of comic videos and $135,000 worth of guest speakers, one of whom collected $17,000 to paint portraits of famous personages on stage, an audit found. The two-day, $4.1 million event staged at Hilton and Marriott hotels by the IRS’ Small Business/Self Employed Division was authorized according to procedure by deputy commissioners and paid for with unused funds from a hiring initiative in the agency’s enforcement budget, according to the audit released Tuesday by the Treasury Inspector General for Tax Administration. The Anaheim event titled “Leading Into the Future” was one among 225 IRS conferences from fiscal 2010 to 2012 costing some $48.6 million, TIGTA found, and took place before an Obama administration crackdown on conference spending that began in 2011. Attendees, who included locally based employees who stayed in the hotels, earned 24 hours leadership training credits, but were not required to document attendance at the two dozen repeating sessions. Nor were managers properly documenting per diems, the audit found. Some $64,000 was spent on giveaway swag for all attendees, including thousands of logo-emblazoned “brief bags” and spiral journals, 800 lanyards, 75 travel mugs and 75 picture frame/clocks, and various other customized knickknacks such as pens, can coolers and Post-It notes. The speaker who painted such figures as Abraham Lincoln and Michael Jordan, according to the contract, “was uniquely qualified to deliver this presentation because of the combination of his artistic abilities and his presentation skills. In each presentation, he will create a unique painting that reinforces his message of unlearning the rules, breaking the boundaries, and freeing the thought process to find creative solutions to challenges.” Following the sessions, the paintings were auctioned, but the final painting was lost, the audit said. The commissioner of the Small Business/Self-Employed Division, the audit found, stayed five nights in a presidential suite at the Marriott, a room that ordinarily retails for $3,500. 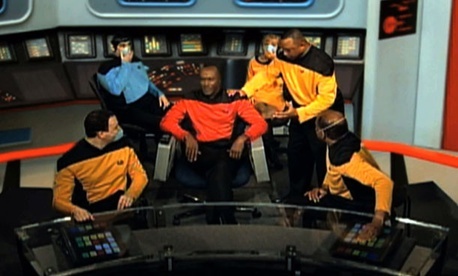 The division spent $50,187 on “videos” for the conference, including a Star Trek parody made in the IRS’ studio in New Carrollton, Md., on a set costing $2,400; the division was unable to provide any details supporting this cost. Since the conference ended, TIGTA noted, the Office of Management and Budget in May 2012 issued new guidelines stipulating that “agencies may not incur net expenses greater than $500,000 for a single conference and that agencies must publicly report (on their official website) all conference expenses in excess of $100,000.” Treasury Department guidance implemented in November 2012, it added, now requires any conference hosted or sponsored by its bureaus costing $250,000 or more be approved by the Treasury secretary. TIGTA made nine recommendations for better economizing on conferences and tracking expenses per employee, to which IRS management agreed. A copy of one of the videos showing IRS employees line dancing in preparation for the Anaheim conference was released on Friday by House Ways and Means Committee Republicans. An Oversight hearing is set for Thursday featuring testimony from Faris Fink, commissioner of the IRS’s Small Business and Self-Employed Division, acting IRS commissioner Danny Werfel, Inspector General J. Russell George, and assistant Inspector General for Audit Gregory Kutz.